He was a handsome, stylish Italian-American from the streets of Brooklyn who strutted into prominence at the same moment John Travolta’s Tony Manero did the same on the silver screen. But there was more to Lee Mazzilli than a pair of tight-fitting pants. He was a graceful athlete with a good eye who could hit – and throw – either left-handed or right-handed. He was a seven-time national youth speedskating champion. And after a 14-year playing career, he found success as an actor, a businessman, a big-league manager, and a broadcaster. Lee Louis Mazzilli was born on March 25, 1955, in Brooklyn, the youngest of Libero and June Mazzilli’s three children. Libero, whose family had immigrated to America from Bari, Italy, worked the family trade as a piano tuner and was also a professional welterweight boxer. The family lived in a second-floor apartment on East 12th Street between Avenue Y and Avenue Z in the Sheepshead Bay section of Brooklyn, minutes from Coney Island. Neighborhood kids played stickball, punch-ball, and other baseball variations on the street and organized games in the Gil Hodges Little League, but young Lee grew up with a second sporting passion. Introduced to ice skating by his father, Lee became the standout among of a group of young speedskaters in his family including his sister, Joanne, and his cousins Raymond and Arthur Mazzilli. Skating at area rinks including Prospect Park in Brooklyn, Flushing Meadows Park across from his future working address in Queens, and Wollman Rink in New York’s Central Park, Lee was soon winning local and regional tournaments. Between the ages of 12 and 16, he won or shared national age-group Long Track national championships three times and won a Short Track national title four times. Records from the National Speedskating Hall of Fame show Mazzilli winning a long-track title in 1970 as a 15-year-old while Olympian Eric Heiden, then 13, took the same title in his age group. In baseball Mazzilli had made a name for himself with blazing speed he flashed on the bases and in the outfield. His game was further distinguished by the fact that he could bat, throw, and catch with equal ease with either hand. Mazzilli owned two gloves and didn’t seem to care which he used. An admirer of Willie Mays, Mazzilli perfected his own version of Mays’ “basket catch,” catching fly balls in an upturned glove just as they reached his waist, exhibiting a cool economy of movement. On the bases, he preferred dramatic head-first slides, adapting the aggressive style of Pete Rose. At Lincoln High School he hit .386 over three seasons. Before Mazzilli made his professional debut the following spring, he and the Mets came to a fateful decision. Eschewing what might have been his more natural throwing arm, the Mets encouraged Mazzilli to throw exclusively right-handed, figuring it would afford him greater defensive flexibility. Mazzilli spent all of the 1974 season at Anderson of the Western Carolinas League, hitting .269 but already exhibiting an exceptional batting eye, drawing a team-best 76 walks and stealing 46 bases, second-most in the six-team circuit. As a 20-year-old at Visalia of the Class-A California League in 1975, Mazzilli upped his batting average to .281 and his on-base percentage to .409, and stole 49 bases – seven during a single seven-inning game at San Jose, tying a record set twice before in nine-inning games. Mazzilli accomplished the feat by walking twice and singling in his first three at-bats, and stealing second and third each time. In a fourth turn at the plate, he walked, went to second on a single, then stole third. An even stronger season at Jackson of the Double-A Texas League in 1976 – Mazzilli batted .292 with a slugging average of .456 and an on-base percentage of .439, and led the league with 111 walks – earned him a September call to the Mets. He made his major-league debut on September 7 as a late-inning defensive replacement for outfielder John Milner at Wrigley Field and, batting left-handed, bounced out to Cubs pitcher Joe Coleman. The next afternoon he entered as a pinch-hitter in the ninth inning and lined a first-pitch fastball from lefty Darold Knowles over the fence in left for a three-run home run. Mazzilli’s signature arrival came a few weeks later at Shea Stadium, when he pinch-hit a two-out, two-run home run off Pirates relief ace Kent Tekulve to spark a 5-4 walk-off win for the Mets. The loss devastated the Pirates, who in the month prior made up more than 11 games chasing down faltering Philadelphia for the National League East pennant, but they never got any closer after Mazzilli struck. PIRATES BURIED BY UNKNOWN SLUGGER, lamented the Pittsburgh Press. These moments of high drama helped to raise Mazzilli’s profile as a candidate to take over center field on a full-time basis in 1977, although there were detractors. Veteran Tom Seaver, for one, arrived at spring training in 1977 loudly complaining about the team’s lack of a center fielder. His tirade was more a criticism of the front office’s decision to eschew the inaugural free-agent class of 1976 – Gary Matthews in particular – than a specific swipe at Mazzilli, but it set the tone for a dysfunctional and chaotic few months that resulted in the shocking trade of Seaver to Cincinnati and an environment that ensured that young players like Mazzilli, ready or not, would absorb the spotlight. Despite remarks in the press suggesting that Mazzilli would need more seasoning, Mets officials offered little resistance to his ascendancy. Pepe Mangual, foolishly acquired in a trade for veteran center fielder Del Unser in the summer of ’76, flopped in his late- season audition and would spend most of 1977 in the minors. Fellow youngster Bruce Boisclair was viewed more as a reserve corner outfielder and, as Seaver reminded everyone, they failed to get a center fielder over the offseason. 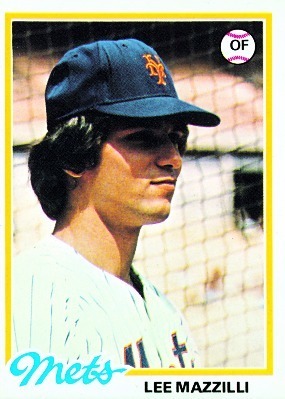 The 22-year-old Mazzilli played in 159 games in 1977. He was fortunate to have a veteran mentor in teammate Joe Torre, who like Mazzilli was an Italian-American from Brooklyn and took the youngster under his wing. Weeks before the Seaver trade, Torre was named Mets manager, and the two New Yorkers would remain with the Mets for the next five years. Mazzilli hit .250 in his rookie year and improved to .273 in 1978, mainly as a result of big strides in his performance as a right-handed hitter, boosting his batting average against left-handers from .228 in 1977 to .286 in ’78; and his slugging percentage from a paltry .289 to a robust .446. By 1979 Mazzilli was one of the National League’s brightest young stars, hitting better than .300 from both sides of the plate (.302 righty, .306 lefty) with 15 home runs, 34 steals, and a .395 on-base percentage, fourth in the National League. The Mets in the meantime had deteriorated around him. They lost 98 games in 1977, 96 in 1978, and 99 in 1979, finishing comfortably in last place each year. With attendance plummeting to historic lows, Mazzilli became a focus of the Mets’ marketing pitch. It was a role he was ideally suited for but uncomfortable fulfilling. There was no doubt Mazzilli oozed fan appeal. Listed at 6-feet-1 and 180 pounds with the prominent thighs of a speedskater, Mazzilli could fill a uniform like few others – though it was often suggested he had it cut extra tight. Dark-haired, dark-eyed, and olive-skinned, he had a look that recalled stars in popular culture of the time including John Travolta – whose Saturday Night Fever captured the phenomenon of the disco era – and Sylvester Stallone, whose Rocky Balboa character shared the “Italian Stallion” nickname with Mazzilli. Young fans, particularly females, mobbed him wherever he went. He fielded offers from Hollywood, including a role on TV’s Laverne & Shirley and a part in Martin Scorcese’s film Raging Bull, but he’d put acting off until after his baseball career. Pizzazz on the field played into Mazzilli’s appeal as well. Fans cheered his basket catches and head-first slides. But even Mazzilli’s habit of stretching his chest as he approached the plate before at-bats broke thousands of hearts. Keenly conscious of his image, and of his statistics, Mazzilli clearly liked earning the adulation of fans, including members of his extended family who became a constant presence at Shea Stadium. But he also tried to keep a low profile off the field. The first Mets player to be featured in a beefcake poster giveaway day often described himself as quiet, shy, and low-key, and preferred pinball arcades to discotheques. Mazzilli put on a show in the 1979 All-Star Game in Seattle. Entering as a pinch-hitter for Gary Matthews with the National League trailing 6-5 in the eighth, Mazzilli tied the game with an opposite-field home run off Texas relief ace Jim Kern. In the ninth inning, Mazzilli worked a two-out, bases-loaded walk from Ron Guidry of the Yankees, driving in what would hold up as the winning run in a 7-6 National League win. For Mets fans Mazzilli’s performance in what turned out to be the only All-Star Game appearance of his career ranked as one of the rare highlights of a black era in the team’s history. There was some irony in the fact that the Most Valuable Player Award in the game went not to Mazzilli but to Dave Parker, whose powerful arm in right field gunned down AL rivals at third base and home during the contest. It underscored the one major flaw in Mazzilli’s game. Mazzilli was held overnight for observation and had a large bruise on his cheek, but was back in the Mets lineup after missing just three games. There was some speculation that a grand mal seizure suffered by Mazzilli long after his playing career might have been related to the incident. Mazzilli’s throwing woes, along with a trade of Willie Montanez to Texas, had the Mets begin experimenting with playing Mazzilli at first base late in the 1979 season – the one place where throwing left-handed would have been an advantage. The organization also knew the day was coming when it would have to make room for a young center fielder then at Triple-A Tidewater, Mookie Wilson. Mazzilli, who once said he was “born to play center field,” framed his willingness to make the move as a sign of his respect for Torre. Appreciative of Mazzilli’s work ethic and his ability as a drawing card, the Mets late in the 1979 season gave him a five-year, $2.1 million contract that made him the highest-paid player in team history. At a signing event, Mazzilli arrived with two boxes of long-stem roses, presenting one to his mother, June, and the other to Mets chairwoman Lorinda de Roulet. Both ladies were moved to tears. Mazzilli opened the 1980 season as the Mets’ regular first baseman – veteran acquisition Jerry Morales was in center – but with neither player hitting well by June, Morales was benched and Mazzilli went back to center field. It was only then that Mazzilli hit like a first baseman – including a sizzling stretch in early July when he hit home runs in four straight games. He finished the year at .280 with a .370 on-base percentage and a .431 slugging average, matching a career best with 16 home runs, and stealing a career-high 41 bases. Wilson arrived as expected in September and Mazzilli was moved back to first base. He was neither place in 1981, moved to left field to accommodate Wilson while the reacquired Dave Kingman took over at first base. But Mazzilli had a rough year, battling elbow and back problems, and finished the strike-interrupted season batting .228, and seeing his mentor Torre fired by the Mets on the season’s final day. Then, in an offseason move that ultimately sealed Mazzilli’s fate, the Mets acquired superstar left fielder George Foster of Cincinnati. General manager Frank Cashen, acknowledging that the 27-year-old Mazzilli would not likely settle for a reserve role he was to be offered in New York, swapped him to the Texas Rangers during spring training of 1982. The trade appeared to have wounded Mazzilli’s pride, particularly when he learned he was dealt not for a front-line starting pitcher, as had been rumored through the winter, but for two minor leaguers he’d never heard of. But the deal turned out quite well for the Mets. One was Ron Darling, who became a stalwart of the Mets’ starting rotation (and incidentally inherited Mazzilli’s standing as the team’s designated matinee idol); the other was Walt Terrell, who was later flipped in a trade for Howard Johnson, one of the Mets’ all-time-best offensive players. Mazzilli was back in New York before long. Battling wrist and shoulder woes in Texas, he was moved by the Rangers to the Yankees in a trade for Bucky Dent in August. He filled in for the Yankees in 37 games at left field, designated hitter, and first base, but was on the move again that winter, traded to Pittsburgh for four minor leaguers. The Pirates saw Mazzilli as a successor to departed center fielder Omar Moreno, but his skills were decidedly underappreciated in Pittsburgh. Despite leading the National League in on-base percentage and walks, Mazzilli was benched in June of ’83 when the Pirates traded for Mets Triple-A center fielder Marvell Wynne and installed Wynne immediately into the starting lineup. Pirates manager Chuck Tanner suggested that concern over Mazzilli’s throwing arm prompted the move. Mazzilli spent most of the rest of the year on the bench. In 1984 Mazzilli started 71 games for Pittsburgh, almost all in left field, but hit just .237. It turned out to be the 29-year-old Mazzilli’s last sustained stretch as a starting player. Over the coming five years, he would become known for pinch-hitting, leading the National League with 72 pinch-hitting appearances and a .437 on-base percentage as a pinch-hitter in 1985. He was one of several Pirates who testified before a grand jury as part of the drug trials but was not among those disciplined by Commissioner Peter Ueberroth. He was released by the rebuilding Pirates in 1986 and was signed to a minor-league deal by the Mets, who’d become a powerhouse since trading him in 1982. Mazzilli spent a week at Triple-A Tidewater while the Mets made room for him on the roster – ironically, by releasing George Foster, whose arrival cost Mazzilli his job back in ’82 but whose attitude and production soured with the Mets. At last comfortable in a reserve role, Mazzilli proved a valuable fit with the streamrolling ’86 Mets. In Game Six of the World Series, he singled off Boston’s Calvin Schiraldi and later scored the tying run as the Mets rallied to tie the game in the eighth inning. In the decisive Game Seven, Mazzilli’s one-out pinch single in the sixth inning sparked the Mets’ rally from a 3-0 deficit. As the Mets celebrated their first world championship since 1969 – and the only one in Mazzilli’s playing career – few players could better appreciate how far they’d come. The Toronto Blue Jays were loading up for a pennant race when they acquired Mazzilli from the Mets on a waiver claim in 1989. Mazzilli was 4-for-7 as a pinch-hitter, including his sixth career pinch-hit home run, as the Jays prevailed to win the American League East, but he went 0-for-8 as the Jays lost the ALCS to Oakland in five games. Mazzilli retired from baseball after the 1989 season. He and his wife, the television host Danielle Folquet, had a young daughter, Jenna, born in 1988; and twins, Lacey and L.J., were on their way. For a time his flirtation with show business got serious. He appeared as a guest star on the television series Big Brother Jake, did commentary for the Game of the Week on CBS Radio, and co-hosted Sports Extra, a weekly television sports talk show with Bill Mazer, airing on New York’s Channel 5. In 1992 Mazzilli landed the starring role of Tony Nunzio in the Off-Broadway interactive comedy Tony ’n’ Tina’s Wedding opposite Sharon Angela. Mazzilli credited the actor Dan Lauria, whom he befriended while auditioning for roles during his playing days, with helping him make the transition. Mazzilli pursued other avenues as well. He was a partner in a 10,000-square-foot sports bar, Lee Mazzilli’s Sports Café, that opened on Manhattan’s Upper West Side in 1994. But with a players strike looming, it turned out to be a bad time for a baseball-themed restaurant. He moved on to a position with a mortgage bank and in 1995 became commissioner of the independent Northeast League. In 1997, at the request of his friend Joe Torre, Mazzilli put on a uniform again, managing the Tampa Yankees (Class A) for two years and the Norwich Navigators of the Double-A Eastern League in 1999, helping to usher players including Nick Johnson, Alfonso Soriano, and Marcus Thames to the majors. In 2000 Mazzilli joined Torre’s staff as the Yankees’ first-base coach, helping guide them to a World Series victory over the Mets. Along with Don Mattingly, Willie Randolph, and Joe Girardi, Mazzilli was one of several graduates of Torre’s Yankees coaching staff to go onto a managing career. The Baltimore Orioles hired him in 2004 to replace Mike Hargrove. The Orioles went 78-84 and finished in third place in his first season, the Orioles’ best finish since 1997. The 2005 team jumped out to a 42-28 start then faltered badly, falling all the way to 52-56 when Mazzilli was fired on August 4 and replaced by Sam Perlozzo. Some writers covering the Orioles suggested that Mazzilli had an especially difficult job in Baltimore, answering to co-general managers (Mike Flanagan and Jim Beattie) and a demanding owner (Peter Angelos), and was forced to work with an existing coaching staff that included candidates he beat out for the managerial job in the first place. Steroid scandals following Orioles veteran stars Sammy Sosa and Rafael Palmeiro that summer were also a likely factor in the decision, some have suggested. These explanations have not come from Mazzilli, who in interviews maintains that the Orioles treated him fairly and recounts a positive experience in Baltimore. Although another managerial job had not surfaced, Mazzilli remained in demand in New York, serving as Torre’s bench coach with the 2006 Yankees and spending two years as a studio analyst for SNY, the Mets’ television network. Most recently he was working in the Yankees’ front office, and closely following the games of his son, L.J., a second baseman at the University of Connecticut who was drafted by the Minnesota Twins in 2012. L.J. bats and throws right-handed exclusively. An updated version of this biography is included in the book "The 1986 New York Mets: There Was More Than Game Six" (SABR, 2016), edited by Leslie Heaphy and Bill Nowlin. Author interviews with Bob Fenn, Dan Castellano, and Michael Scotti, June-July, 2012. Arangure, Jorge Jr. “No Bad Feelings for Mazzilli,” Washington Post, April 22, 2006. Ellison, Jack. “Mazzilli Shows His Speed With Mets,” The Sporting News, November 6, 1976. Feeney, Charley. “Bucs Give Wynne Center Field Post,” The Sporting News, June 27, 1983. Groves, Seli. “Lee Mazzilli: Diamonds Guy’s Best Friend Too,” King Features Syndicate, Spokane Spokesman-Review, December 22, 1992. Lang, Jack. “Mets Smacking Their Chops Over Frilly Mazzilli,” The Sporting News, September 25, 1976. ------ “Mets All Steamed Up Over Hot Mitt Prospect Stearns,” The Sporting News, October 9, 1976. ------ “Dissension? It’s Name of the Game on Sinking Mets,” The Sporting News, June 11, 1977. ------ “Mazzilli’s Pact Raises Met Question,” The Sporting News, September 8, 1979. ------- “Torre Circles Wagons and Mets Dig In,” The Sporting News, June 21, 1980. Noble, Marty. “Trade to Texas Angers Mazzilli,” Newsday, April 2, 1982. ------ “Injury to Byrd Forces Cameron to Reflect,” MLB.com, May 23, 2011. Reeves, Jim. “ ‘Hope I Can Help,’ Dent Tells Rangers,” The Sporting News, August 23, 1982. Rudel, Neil. “Marvell Wynne in, Mazzilli Out,” Beaver County (Pennsylvania) Times, June 15, 1983. Reimer, Susan. “The Home Team,” Baltimore Sun, May 16, 2004. Shalin, Mike. “Mets Ready to Deal Maz or Youngblood,” New York Post, February 5, 1982. Sheinin, Dave. “Slumping Orioles Fire Mazzilli as Manager,” Washington Post, August 5, 2005. Smizik, Bob. “Pirates Buried by Unknown Slugger, 5-4,” Pittsburgh Press, September 21, 1976. Swift, E.M. “Hometown Kid Makes Good,” Sports Illustrated, July 23, 1979. Zeigel, Vic. “Urban Centerfielder,” New York, August 18, 1980. “A grand theft effort by Visalia’s Mazzilli,” The Sporting News, July 5, 1975. “Inside Pitch,”Sports Illustrated, April 25, 1983. 1 Author interview with Bob Fenn, July 12, 2012. 2 John Eisenberg, “Mazzilli Does It All – And Does it Well,” Baltimore Sun, November 16, 2003. 3 Hal Bock, “Mets Draft Outfielder,” Associated Press, Newburgh (New York) Evening News, June 6, 1973. 4 Marty Noble, “For Mazzilli, Nothing Like Meeting Mays,” MLB.com, September 8, 2008. 5 Pat Calabria, “Just the Kid Next Door,” The Sporting News, August 16, 1980. 6 “Inside Pitch,” Sports Illustrated, April 25, 1983. 7 John Nadel (Associated Press), “Lee Mazzilli Kayoed in Collision,” Newburgh (New York) Evening News, July 24, 1979. 8 Jack Lang, “Hebner’s Silence Handicaps Mets,” The Sporting News, September 1, 1979. 9 Associated Press, “Mazzilli Berates Strawberry,” Albany (Georgia) Herald, July 2, 1987. 10 Author interview with Dan Castellano, July 5, 2012.